Those who enjoy the finer things in life are in for a real treat thanks to the launch of a 'Press For Champagne' service at one of Birmingham's most exquisite venues. Champagne will be available at the touch of a button at the Edwardian Tearooms, a unique setting within Birmingham Museum and Art Gallery, meaning those who would prefer a glass of champers than a cup of tea are in luck. Birmingham Museum and Art Gallery have partnered up with award-winning House of PIPER-HEIDSIECK Champagne for the service so visitors to the tearoom with a twist will be hand delivered a glass of their finest. 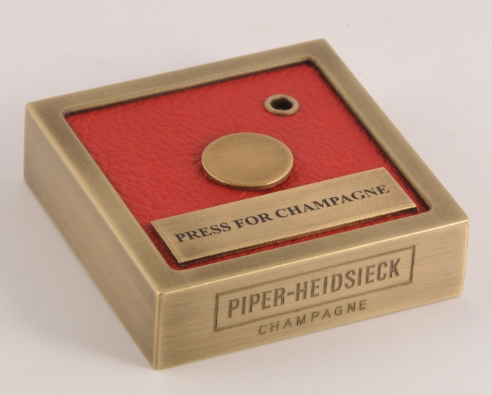 Inside the Edwardian Tearooms, each private booth has been installed with its own Champagne buzzer where once pressed, a server will be on hand to guide the table through the full PIPER-HEIDSIECK menu. The menu includes the Brut NV which embodies the house style, the complex Vintage 2008, and award-winning and very exclusive Rare Millesime 2002, which can be pre-ordered for special occasions. Alex-Nicholson Evans, commercial director at Birmingham Museums Trust, said: "Birmingham Museum andArt Gallery and the house of PIPER-HEIDSIECK have a long history of excellence in their respective fields, and this partnership just further demonstrates each company's innovative talent. "We are thrilled to be able to offer this new service to our customers - they can enjoy sipping champagne whilst knowing they are helping the city's museums, as all profits from the Edwardian Tearooms go to support Birmingham Museums Trust." The 'Press for Champagne' is available at the venue now, and is set to go well alongside the Edwardian Tearoom's festive menu which arrives later this month. The Edwardian Tearooms is open Saturday-Thursday 10am-4.30pm and Friday 10.30am-4.30pm.